Air Valet provides the most technologically advanced, sleekly designed air machines available. 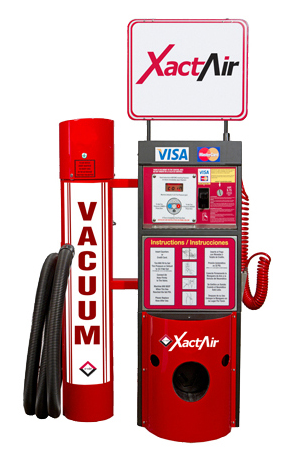 At absolutely NO COST TO YOU, Air Valet quickly installs our state-of-the-art XactAir equipment. All service, collections, and reporting are provided by Air Valet – and we SHARE THE REVENUE WITH YOU. No loopholes, no expense, just generous revenue sharing paid to you. When compared to other programs, Air Valet customers experience significant increases in revenue and uptime. So what are you waiting for? From high-impact lighted signage to sleek stainless steel bodies, our machines are not just functional, but designed to attract drivers to your convenience store or fuel station. Easy-to-read instructions include step-by-step drawings and Spanish translation, which offers additional ease of use and less need of assistance from your staff. Choice of credit card, debit card, or cash payment offers your customers convenience that keeps them coming back. Air Valet leads the industry with an excellent combination of service, technology, and design. Air Valet also stands apart with our innovative XactAir machines equipped with wireless uplink on every new machine – nationwide. That wireless monitoring means less downtime and more revenue for you. In fact, our national average uptime is 98.45%! XactAir machines self-monitor for service, usage, and cash, auto-dispatching directly to local field engineers when service is needed. Air Valet machines auto-calibrate air pressure, making them simple to use, which generates repeat business. Combined with 24/7 monitoring and excellent uptime, Air Valet gives your store an edge over the competition. We look forward to connecting with you. Please fill out the form below or call us for prompt answers to your questions!